Good Food For Your Table is a grocer's guide: this is the shopping basket deconstructed, including all you need to know about seasonality, provenance, storage, preserving and serving the very best food. 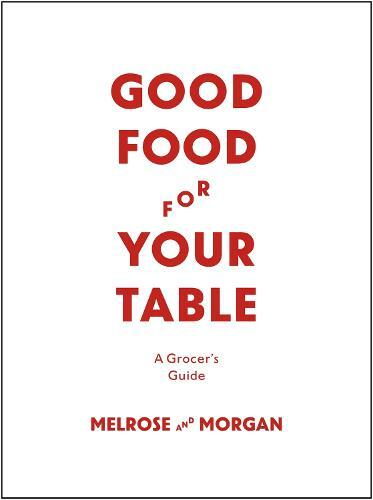 Melrose and Morgan have ten years' experience as high-street grocers, and here they share expert information to help you buy the best food so there will always be good things to eat at home. A well-stocked larder is the backbone of any kitchen, and this book is a compendium of advice on the best ingredients to buy and how to manage your kitchen cupboard to ensure nothing goes to waste. It also includes a selection of favourite recipes and simple, quick ideas to rustle up a meal. If you've ever found yourself confused about the difference between mixed spice and allspice, Stilton and Stichelton, quinoa and couscous, then this is the book for you. We all want to be more knowledgeable about the food we eat, and this is the essential storecupboard handbook that no discerning cook should be without.